Economical hand-operated gun with rotating shell for 280/290/300/310 ml cartridges. Adapter with internal thread for screwing onto graded and straight tip of OTTO static mixing nozzles MFQX 10-24T, MGQ 10-16D, MGQ 10-19D and external thread for OTTO standard cartridge nozzle 107 mm or OTTO Flat fishtail nozzle. 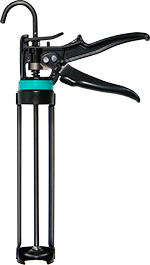 Hand-operated gun with a press capacity of 5 kN for 280/290/300/310 ml cartridges. Ideal for co-axial cartridge system. U-shaped top loader made from fibreglass-reinforced nylon. Single-handed lock release thanks to balanced handle. Transmission ratio 26 : 1 For high-viscose hybrids, polyurethanes and silicones.